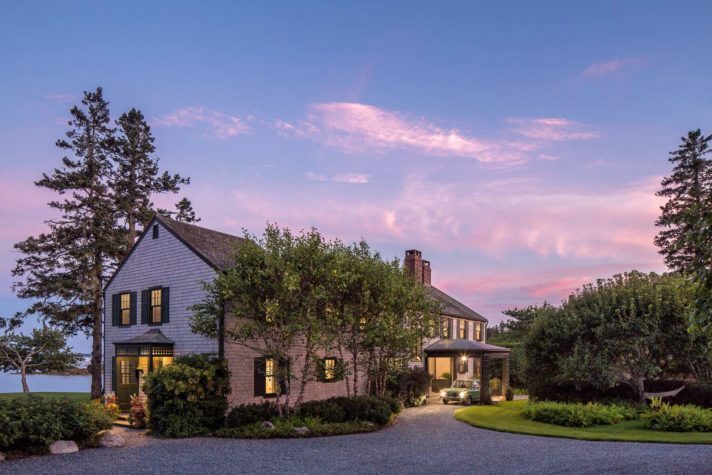 Although technically a shingle-style home, this Bar Harbor mansion feels a bit like a classic Connecticut Colonial. Located on the shore of Southwest Harbor, it’s been transformed into one family’s summer escape, complete with family heirlooms and carefully sourced art selected by interior designer Tom Scheerer of New York. 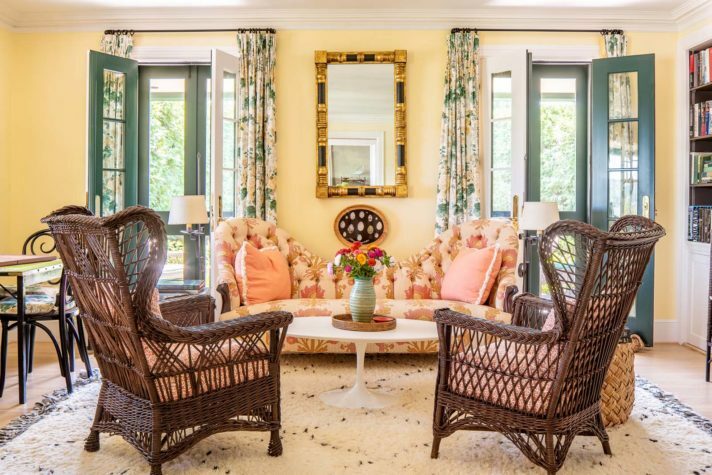 Antique Bar Harbor wicker chairs frame a Saarinen coffee table and a Victorian-style sofa in the living room. 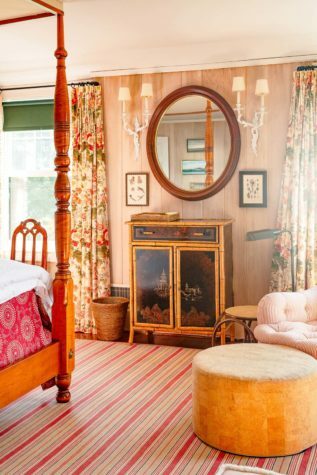 The space has an “organic look to it,” says Scheerer, “which is amazing because it was done in one winter.” The Hollyhock chintz curtains were chosen specifically for this room, but he uses the same pattern in a different shade in the owners’ suite to unify the decor. The owners’ suite was one of the few places where they decided to move the walls. Before, it was “too big,” according to Scheerer. They scaled down the bedroom and added a warm pink-and-yellow color palette. 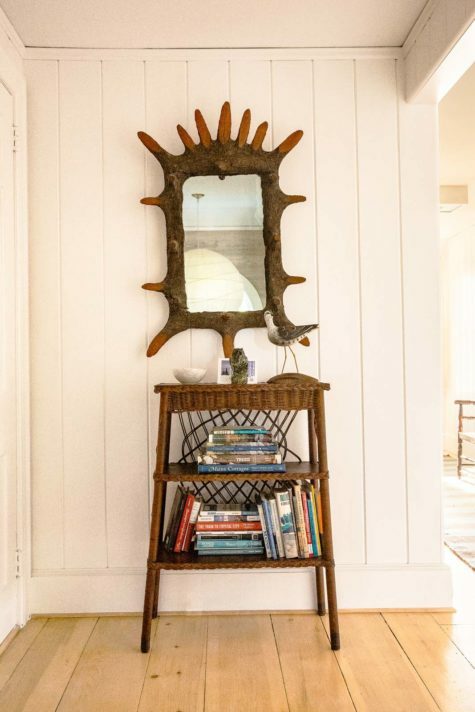 The pickled pine paneling provides additional texture. 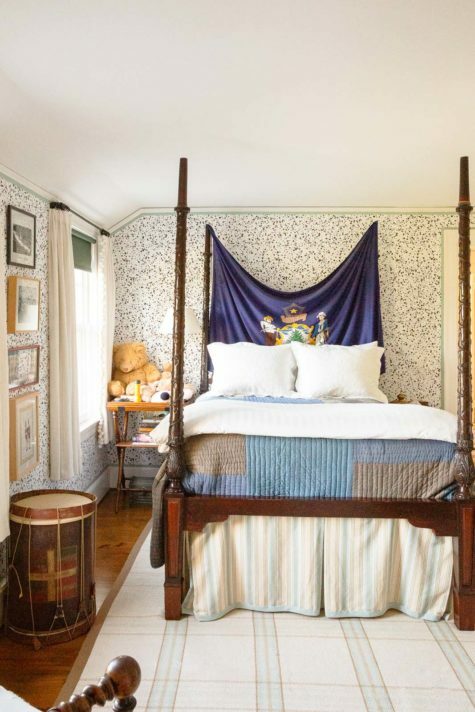 The four-poster tiger-maple bed is a reproduction from Leonards New England, which Scheerer says makes “really good-quality reproduction furniture.” He covered the walls with round framed images of seashells and birds. The dining room features one of the house’s most striking features: the wallpaper. Made from several different images by Fitz Henry Lane that were digitally blended to create a seamless landscape, the effect is “that of hand-painted wallpaper that is found in other houses of that vintage,” says Scheerer. “It’s an Americana kind of thing.” The square table features a Formica top and is surrounded by contrasting black bentwood chairs. 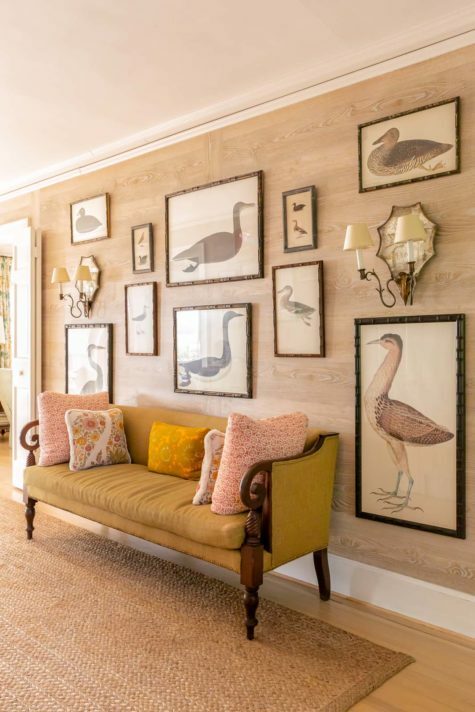 The faux-bois wallpaper in the entryway provides a backdrop for a collection of eighteenth-century Swedish botanical prints by Olof Rudbeck, which depict a variety of feathered creatures. 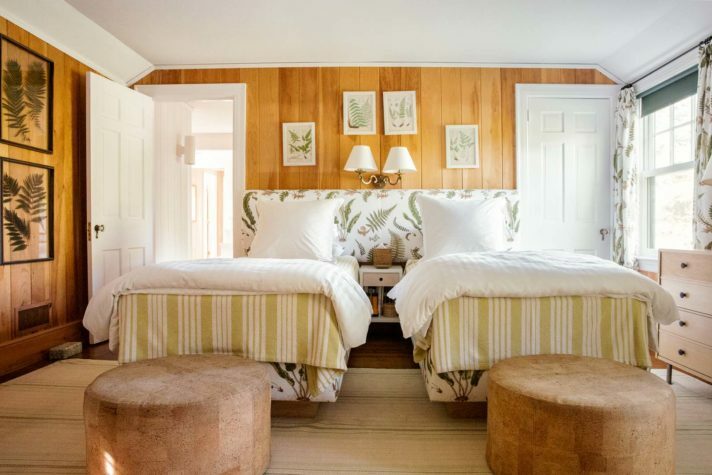 Ferns hang in glass frames on the pine-paneled walls, and more ferns can be found on the curtains, upholstery, and behind the beds. 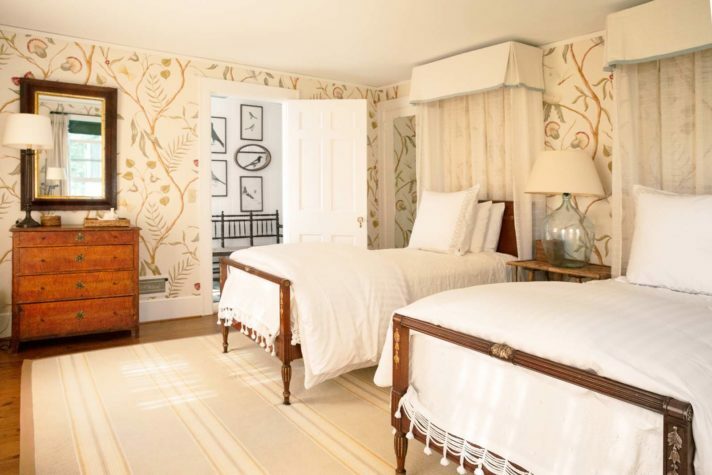 The beds “just barely fit” between the door and the window wall, so Scheerer created a continuous headboard with a custom-built bedside table to link the two twin mattresses (covered in Botanical Fern by Schumacher). “I’ve always associated ferns with Maine for some reason,” he says. 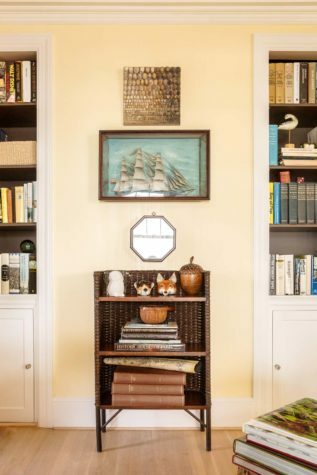 In the living room, the homeowners brought in a framed model ship that is an expert reproduction of a ship owned by one of their ancestors. 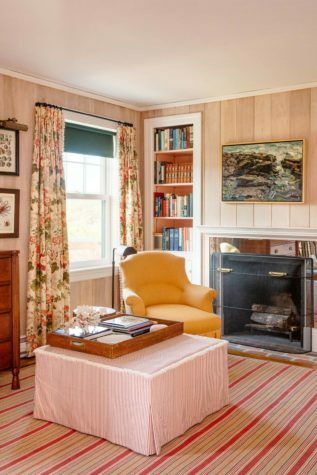 Scheerer chose a sunny yellow for the walls to make the space feel bright, even in the Maine fog. 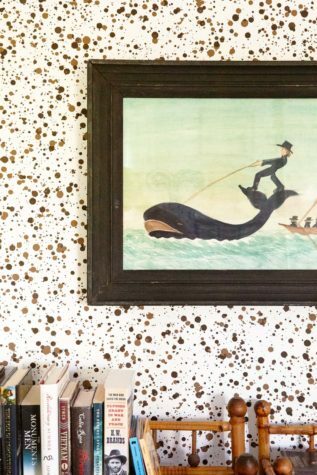 This picture of the whale rider “felt Maine appropriate” for the boy’s room, says Scheerer. The overall design (above) was inspired in part by Sister Parish. When Scheerer was young, he recalls seeing pictures of her Mount Desert Island home in a magazine. “It had some charming little moments in it,” he says. 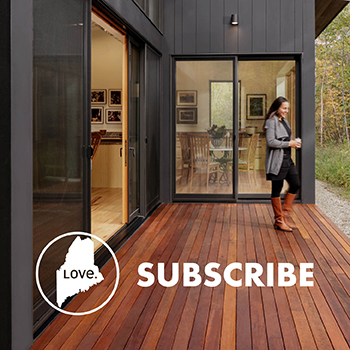 The house “didn’t have anything Maine-y about it” when the homeowners first purchased it, says Scheerer. They decided to paint the shutters and trim a deep forest green to help it connect with the local environment. To maximize the amount of light streaming into the house, Caivano added skylights to the overhang (opposite). “It looks like it’s always been there,” says one homeowner. “But the engineering is so intense.” Even in the harshest storm, the porch will stay put, thanks to the steel brackets that attach it to the house and the steel supports that anchor it to the ground. “It has an organic look to it, I think, which is somewhat amazing because it was done in one winter,” explains Scheerer. 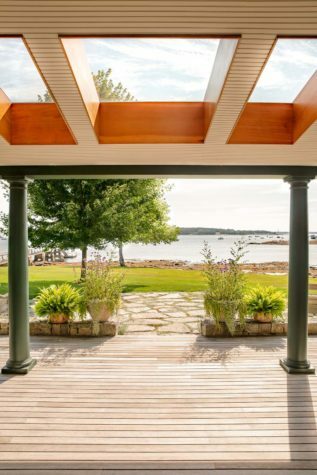 When he first set eyes on the house in late 2007, it “didn’t feel very Maine-y,” he says, despite its prime location on the shore of Somes Sound. It had white trim and white shutters and no porch for weekend lounging. 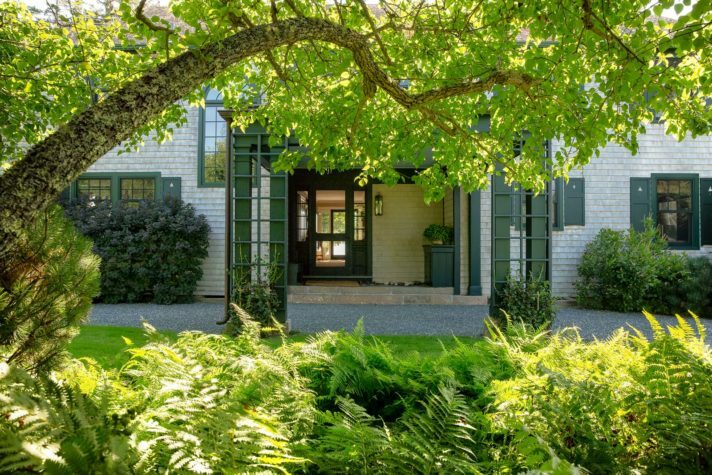 To make it look more at home in its Acadian surroundings, Scheerer painted the trim and shutters dark green and replaced the windows, also hunter green to match the other accenting elements. In order to make the dining room usable for groups as big as 12 or as small as 3, Scheerer had a square table built to fit the equally square space. “I felt quite strongly that we needed a square table,” he says. “If you have two people, you can sit at the corner quite neatly, but we also had leaves custom made so it can be expanded.” He surrounded the white-painted table with lightweight bentwood chairs, finishing the space with a neutral and durable sisal rug. The girls’ room is similarly unaltered though the girls have grown up as well. Luckily, there’s nothing particularly childish about the space. Instead, Scheerer went for a botanical theme. It’s a smaller room, so he maximized the space by creating a continuous headboard to link the two twin beds, complete with a “teeny little bedside table that fits just between.” He says, “That’s a little trick of mine. 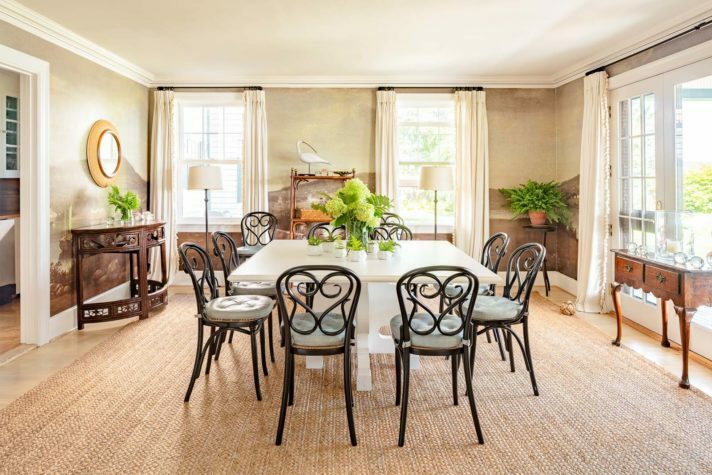 I then had it covered by an upholsterer of mine in New York.” The fabric matches the fern prints that Scheerer hung on the wall, as well as the dried ferns preserved behind glass that he found in a local boutique. Two big cork-covered ottomans sit at the end of the beds, giving extra seating space for when friends come over.